HKOWRC would have preliminary classification on the food waste. Higher nutritional value of food waste would be manufactured to EM feed by EM bio-fermentation technology, mainly as fish and pig feed. 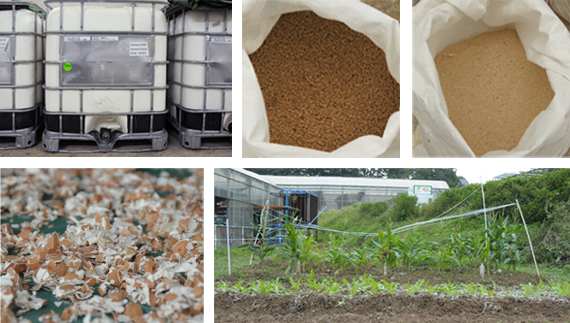 The food waste with lower nutritional value and more cellulose will undergo anaerobic fermentation, together with the EM yeast to make compost which can be used in organic farming. HKOWRC explores the possibility of recycling organic waste and create the brand “FOOD CYCLE+” for product selling. “FOOD CYCLE+” promises to promote green consumption, we emphasis recycling of food waste and reproduction, design and sale of organic matters. We want to achieve a low carbon economy and to connect green live style in the future. We wish each piece of products inspired by environmental protection can let the public have a more enthusiastic attitude towards green life and higher incentive to care our environment.